In my last post, I started to present the Buddhist Studies program at the Karmapa International Buddhist Institute, New Delhi. Having already introduced the institute's history, its location and infrastructure, I will now turn to the academic program itself. Each academic year consists of two semesters: a fall semester from October to December, and a spring semester from January to March. The full diploma program covers a wide range of topics over a three-year period. These include Buddhist languages (e.g. Tibetan and Sanskrit), history and culture, Buddhist religion, meditation and philosophy. 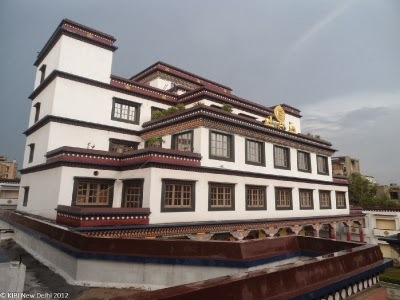 KIBI’s academic staff combines the expertise of renowned scholars trained in both traditional Tibetan Buddhist monastic institutions and modern universities in India and abroad, representing the state-of-the-art in Buddhist studies. Some of the courses, particularly those which cover various Buddhist philosophical treatises, are offered by Tibetan Khenpos (either in English or Tibetan with English interpretation). 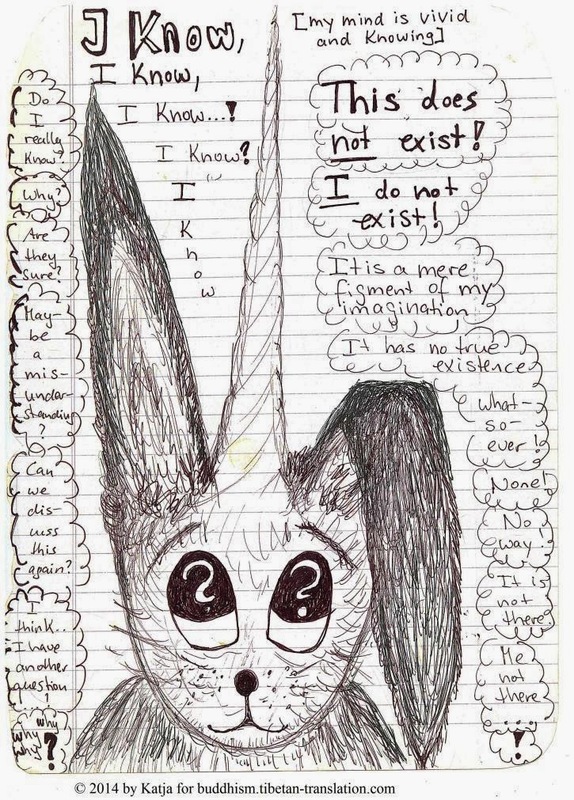 Intellectually, they can be very demanding as this wonderful illustration by Katja shows. Under the guidance of the institute's director Professor Sempa Dorje and the principal, Professor Lara Braitstein, a rich and interesting introduction to Buddhist studies is offered. The curriculum is designed so that students will gain a deep understanding of both Buddhist religious practice and the academic study of Buddhism. The following chart is an overview over the KIBI curriculum of 2013/2014. This post is the third in a series on Buddhist Studies and aims at giving you some idea what it’s like to engage in Buddhist Studies at the Karmapa International Buddhist Institute (KIBI) in New Delhi, India. After attempting in my first post on Buddhist Studies to answer the question of why one would engage at all in Buddhist Studies, I recently presented several good reasons for doing Buddhist Studies at the Universityof Vienna. 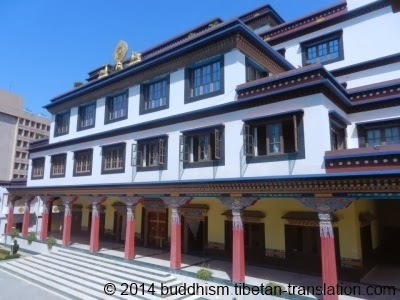 Thus, having already given you an example of an esteemed Western academic institution offering a program in Buddhist Studies, this article will now present a corresponding program at a private Buddhist institute: the KIBI in New Delhi. This program might be particularly interesting for practicing Buddhists who want to study under the guidance of Buddhist masters and in close contact with the living Buddhist tradition. I have chosen to introduce this particular institute for the simple reason that I’ve studied there myself. Therefore, the institute is quite familiar to me, and I feel comfortable telling you about the program. Instead of merely presenting my own personal view, I asked some of my former co-students and friends to contribute by sharing some of their experiences and feelings about the program. Interpreting for Tibetan masters – Are Dharma Interpreters Professionals? After reading the first post on this issue, it should be clear now that the answer can only be yes. It is a highly specialized profession which requires intensive training. Many interpreters look back to 10-15 years of studies. A lot of people need a long time to properly master the Tibetan language. An interpreter also needs a good knowledge of the subject matter he works with. This is often underestimated. In the case of Tibetan interpreters working with Buddhist masters, extensive Buddhist studies are required. Learning the Dharma and its terminology properly is something which takes a lot of time. Hence, a good Tibetan Dharma interpreter ideally is a highly qualified specialist. Nevertheless, there is indeed a big difference to a regular profession: people usually receive a salary for their job. Very often, Dharma interpreters are not paid for their work. In many groups, it is customary that they receive a little donation though. From a traditional religious perspective, this is of course fine. There is however a problem. Why are there so few good Tibetan interpreters? People sometimes ask me why there are so few good interpreters (or translators) for Tibetan. Is it that the language is so difficult? I don’t think so. There are also so many institutes which try to educate interpreters and translators. Why aren’t they able to produce more capable people in the end? Some seem to think that the education in these institutes is not very good. One can’t deny that there are certainly things which could be improved. Still, overall I would say that most of these institutes do quite a good job and offer a wonderful education. In a recent post I had discussed several good reasons for engaging in Tibetan and Buddhist Studies in Vienna. Those of you interested in translation issues, particularly translating Buddhist scriptures from Sanskrit and Tibetan, will certainly be interested in the following information: the Institute for South Asian, Tibetan and Buddhist Studies at the University of Vienna just announced to hold a two-week long "Summer School in Buddhist Text Translation". 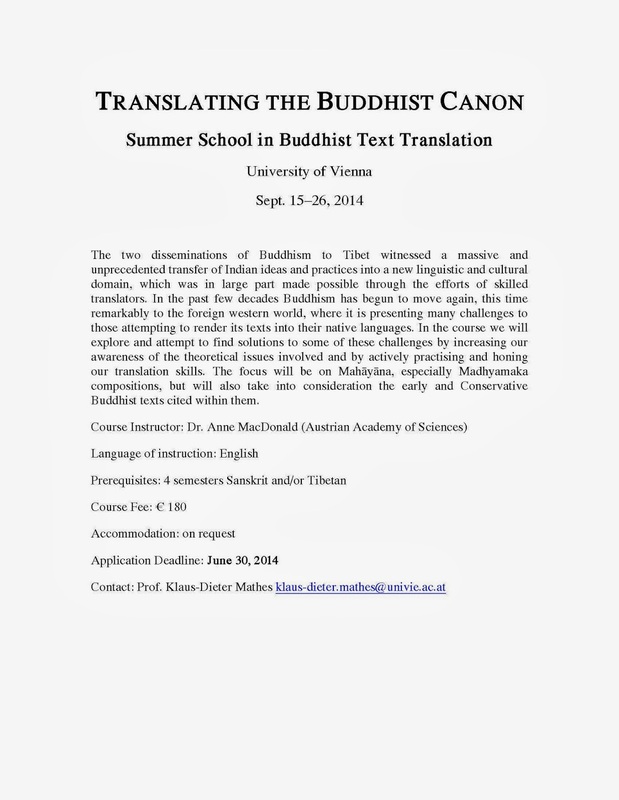 It is a wonderful opportunity for everyone interested in Buddhist canonical translation. The course is lead by Dr. Anne MacDonald, a senior Buddhologist with a focus on the development of Madhyamaka thought in India and Tibet. The two disseminations of Buddhism to Tibet witnessed a massive and unprecedented transfer of Indian ideas and practices into a new linguistic and cultural domain, which was in large part made possible through the efforts of skilled translators. In the past few decades Buddhism has begun to move again, this time remarkably to the foreign western world, where it is presenting many challenges to those attempting to render its texts into their native languages. In the course we will explore and attempt to find solutions to some of these challenges by increasing our awareness of the theoretical issues involved and by actively practising and honing our translation skills. The focus will be on Mahāyāna, especially Madhyamaka compositions, but will also take into consideration the early and Conservative Buddhist texts cited within them. You can download the pdf with further details here. Interpreting for Tibetan masters – a profession like any other? “Interpreting for Tibetan masters“ – a profession? This is indeed true. For the most part, it is very inspiring to spend time with Buddhist masters, helping them to promote their teachings. On the other hand, for those who do this on a regular basis, it has some features which are quite similar to a normal job. Interpreting for a Tibetan master for example goes along with a lot of duties, tasks and responsibilities. Much like a regular job, it is also very time-consuming. If you interpret 15 to 20 weekend courses a year, this will amount to approximately 40 full interpreting days. According to information on the website of the AIIC, this corresponds to 50% of a conference interpreter’s yearly workload. In addition to actual interpretation work, a Tibetan interpreter also has to prepare for his or her engagement. Being invited to interpret at a Dharma course, one is very often also involved in the preparation of the course. There is quite a lot that needs to be done beforehand. If you live in a center, you are anyway involved. Even if not, you may still have to help with the communication between teacher and Buddhist community, for example determining the teaching’s topic, its exact title, content and program. Ideally, you also prepare before coming to a course. Tibetan teachers have a great repertoire with a large range of subjects. Each field has its own terminology which you may need to learn or repeat beforehand. Just think about H.H. the Dalai Lama. He often speaks about Western science and uses associated Tibetan terminology. These terms are often even unknown to a majority of Tibetans. You really can’t afford to show up at a course with no clue about the subject.